"Great recipe I got from my stepmother. Potatoes and tuna that can be made like a twice baked potato, or a casserole." Wrap potatoes in aluminum foil and place on a baking sheet. Bake in the preheated oven until tender when pierced with a fork, about 1 hour. Cool potatoes until easily handled; cut in half. Scoop the potato flesh into a large bowl, leaving the shells intact. 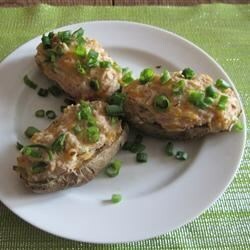 Mix potato with tuna, mayonnaise, and green onions. Spoon mixture back into shells. Press shredded Cheddar cheese on top of each. If you prefer, discard the skins, and bake the potato mixture in a baking dish. This is sort of like a tuna casserole in potato form. Was a big hit with kids, they didn't even notice there was fish. However, it didn't go over well with me. The texture was a little funny. It was good but if you cut the amount of mayo in half and add sour cream, it's even better. This was actually really good. I microwaved the potatoes for 10 min (5min then turned over and another 5min). Added salt and pepper to the tuna, pot, mayo, green onion mix. We love these. They are yummy and easy to make. We make them regularly.